World-renowned tiki legend, writer and owner of Latitude 29 in New Orleans, Jeff “Beachbum” Berry was recently in Australia for the first time as part of the De Kuyper Works Sessions. 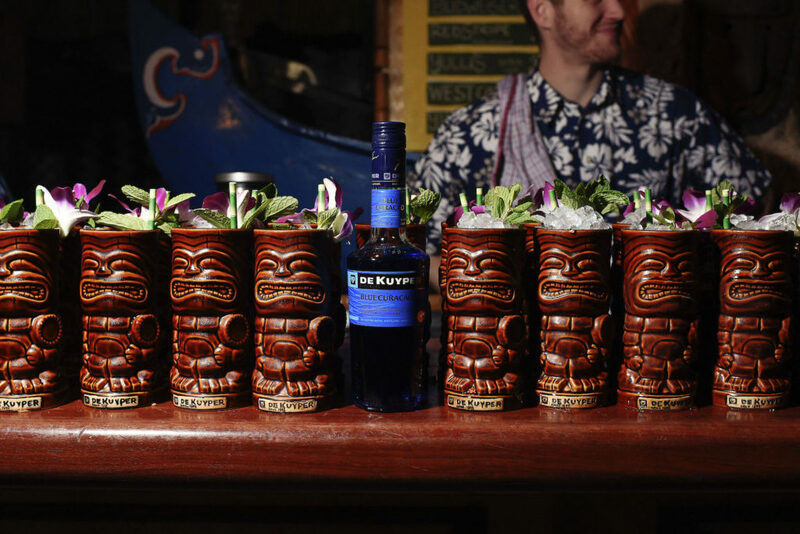 Drinks World’s Lukas Raschilla caught up with Beachbum to talk all things tiki. LUKAS RASCHILLA: Can you tell me what drew you to tiki? JEFF ‘BEACHBUM’ BERRY: When I turned 21, back in 1979, and I could finally go out to drink legally, it was the dark ages of the cocktail scene. Everything was served out of a can, say piña colada mix, or frozen daiquiri mix, and it was the worst time to go and out and try to have a good drink. For years I thought a daiquiri was served in a giant hurricane glass, frozen, laden with strawberries and whipped cream on top. I soon realised a daiquiri was supposed to be served in a coupette and it was just rum, lime, and sugar. The only real craft cocktails being served anywhere in Los Angeles, were tiki drinks, simply because they’re just doing what they’ve always done. They’ve always used fresh fruit juice, they’ve always made their own in-house syrups and blended rums together and managed to balance intricately like eight, 10 or 12 ingredients, those were the only good drinks I had so that was the kind of drinking that I did. I like tropical drinks. LR: Tell me about Latitude 29 and why you decided to open a venue in New Orleans? JB: I’d been going to New Orleans with my wife since 2005 (we were at the Tales of the Cocktail in 2005), and at the time we’d been living in Los Angeles for the last 17 years and Annene was getting sick of it and I was ready to move. Neither of us had ever been to New Orleans and when we first stepped off the shuttle from the airport in the French Quarter we were like, “Where the hell has this place been all our lives? It’s absolutely amazing!” The people were great, the buskers were playing on the streets and over the course of three days, I had a job offer to write for a magazine, we had a place to live and everything was set and then Hurricane Katrina hit. We kept being invited back to Tales every year and each year, our circle of acquaintances in the bar and restaurant scene widened, and it just seemed like that’s where the love was. If we opened a venue in New Orleans we already would have a support system and we would have an audience, and it was the city that we wanted to live in, and they didn’t have a designated tiki bar. LR: You launched a line of glassware as a result of not being able to find the style you were after. Can you tell me about how that came about and evolved? JB: It was interesting. I collected old tiki menus, which were always beautiful – some of them were works of art. They always had great illustrations. Some tiki had their own distinct glassware and that’s what identified them. It was also a clever way of marketing the drinks. One of the things that Don the Beachcomber did to make his drinks more interesting and distinctive, he would serve them in specific vessels that was unique to the drink. For example, the 151 Swizzle was served in this very sleek, metal swizzle cup which was based on the julep cup but it’s just more modern looking and sexier. The Pearl Diver was another one. It had it own ribbed glass within this whole like shell of red. Very, very unique. And in decades of going to thrift stores, yard sales etcetera, I never found either of those two things in the wild. They must have existed! They’ve got to because so many restaurants had pictures of them on the menus. So when Greg Boehm (Cocktail Kingdom) was getting into this whole tiki thing, there wasn’t any kind of tiki glassware or barware for him to work with, I sent him some scans of the Pearl Diver glassware from different venues. I had never seen that Pearl Diver glass anywhere, and he, sometime later, he texted me back with a photograph of three of them that he had in his office! And the tiki glassware went on from there. It was amazing to me to go to places like the Mai Tai Restaurant, that used to serve things like the Deep Sea Diver in that glass, way before my time, and now to go there and have that drink in that glass again. It’s incredibly cool. LR: I have to ask about the ‘Beachbum’ nickname? How did that first come about? JB: There is a back-story. When I first started putting together these little recipe books, it was just for fun. I tried to track down these recipes and make them and, gradually I got asked to be the punch guy at Backyard Luau for all the surfers hanging out on Venice Beach and all the tiki geeks down there. Eventually, people started coming up and saying, “Hey, this is pretty good. What’s in it?” So I went and printed a little-stapled booklet, and one of them found its way to a comic book publisher in San Jose. 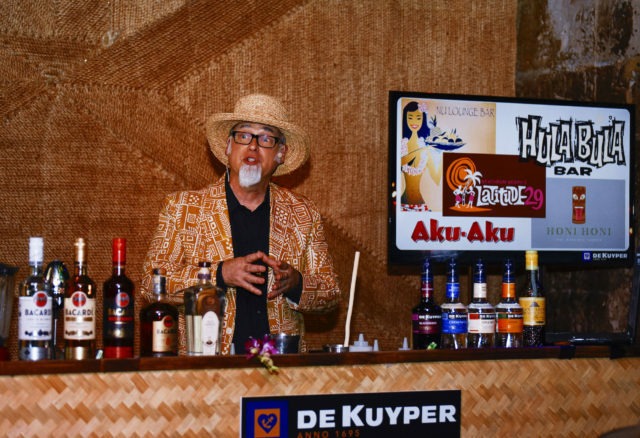 He got in touch with me as was like, “Hey do you want to put together a tiki drinks book?” Which, at the time, who the hell would be interested in that? It was such an underground, alternative thing, but he just really liked tiki and he was willing to take the risk. I had a huge collection of vintage tiki cocktail napkins and matchbooks. To do all the graphics, I would print them black and white, cut them out, refashion them and then tape them with scotch tape back onto the page, use white-out to get rid of the tape lines, photocopy it again until you had this cool little graphic on a page. I did the same thing with fonts; I’m a font geek – if I found a font I liked I wanted to use it for the name of a drink. So, when it came time to do the title page, I was looking for this really cool font that would say, “By Jeff Berry”. I found a font for a place called Beachbum Burt’s, and I could get ‘Berry’ out of it easy, but ‘Jeff’ was kind of hard. And I thought, “Oh, I’ll just use Beachbum. Beachbum Berry, because it already exists”. It was all because I was too lazy to try and cut the letters out for my own name.